Adding Domain Name to OpenShift WordPress, Unlike IaaS Can Be Challenging. We Can Use Free CloudFlare to Make the Process of Pointing Easier. Actually we talked about Pointing Naked Domains to CNAME before; WordPress Development needs checking of the Nightly Builds, one can use OpenShift for this purpose. PaaS, basically can be quite painful for who are not developers. Why Adding Domain Name to OpenShift WordPress is Difficult? cloud.thecustomizewindows.com	canonical name = f4f9597874d3d77289b7-e78c55da223d54933c14da1090eadabf.r71.cf2.rackcdn.com. f4f9597874d3d77289b7-e78c55da223d54933c14da1090eadabf.r71.cf2.rackcdn.com	canonical name = a71.rackcdn.com. a71.rackcdn.com	canonical name = a71.rackcdn.com.mdc.edgesuite.net. a71.rackcdn.com.mdc.edgesuite.net	canonical name = a73.dscg10.akamai.net. We have NOT assigned A record against the subdomain but pointed towards Rackspace Cloud Files using CNAME, which is clearly shown as canonical name. This is one of the reason why with only CNAME the problem happens in case of PaaS. We will not suggest to use Free OpenShift WordPress more than for developmental purpose – there is limitations in free account, with paid account may be you’ll get more official help. However, we will describe the DNS Pointing for Free OpenShift PaaS hosted WordPress. First create a free account on CloudFlare. By now, possibly you have registered a domain via GoDaddy, NameCheap or whatever it is. The second provider is known as Domain Register. The change in Name Server from Domain Register’s account is the final and decisive where the website will point towards. Login to CloudFlare and add the domain. It will scan and provide you custom name servers (two in number). In second step, change the Name Server set from Domain Register’s account (GoDaddy, NameCheap or whatever…). Delete all the records. Add new records freshly. You’ll add CNAME record against yourdomain.com (not with www). CloudFlare will give warning. As CNAME record, you’ll add the OpenShift App’s URL. WWW record will be added automatically. ben.ns.cloudflare.com and uma.ns.cloudflare.com was the custom name server, we added it to Domain Register’s account (GoDaddy). We deleted A Record and added only CNAME. Clouflare mask the CNAME to full. However the problem starts as the App was installed with OpenShift’s URL. So, technically we should update the URL from WordPress Admin panel (that is what we do if WordPress is installed using IP address on full server) and use Search and Replace Plugin to modify towards new url. These what we got from feedback from the real users. It is painful, but basically all are free which otherwise would cost you minimum $30 per month. This Article Has Been Shared 9757 Times! 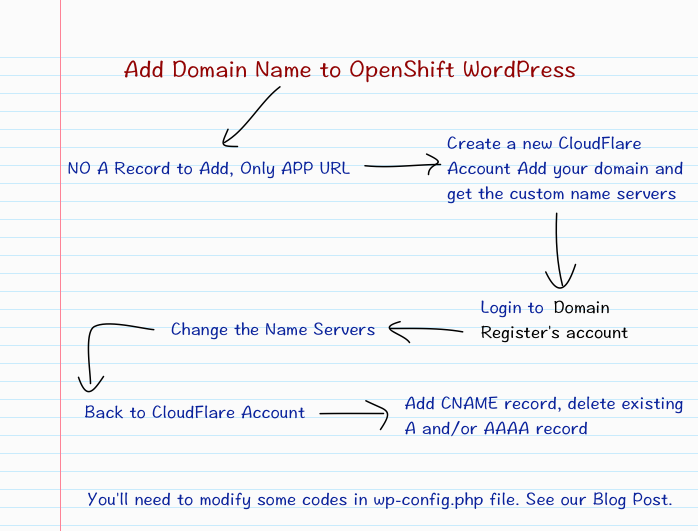 Cite this article as: Abhishek Ghosh, "Add Domain Name to OpenShift WordPress," in The Customize Windows, June 13, 2014, April 21, 2019, https://thecustomizewindows.com/2014/06/add-domain-name-openshift-wordpress/.